The remote Kanas Lake Nature Reserve rests in the northernmost reaches of Xinjiang and is over 180 kilometres (112 mi) away from the nearest town, making it an area resplendent with virtually untouched natural beauty. 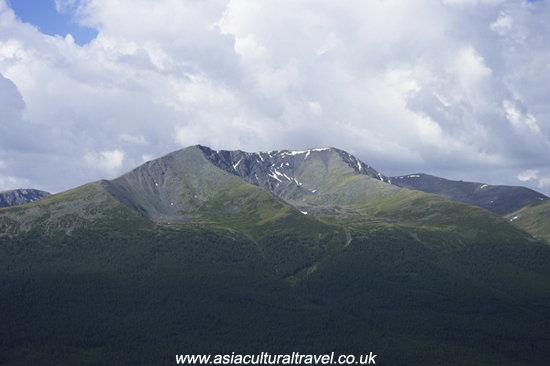 It is situated close to the borders between Kazakhstan, Mongolia, and Russia, and it contains the aptly named Youyi or “Friendship” Peak, which is the landmark where China, Russia, and Mongolia approximately meet. The word “Kanas” means “beautiful, rich, and mysterious” in the Mongolian language and, with its towering snowy peaks, thick green forests, and turquoise hued waters, it certainly lives up to the title! 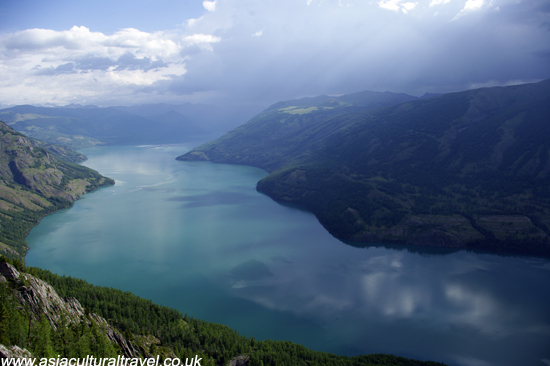 Its primary attraction is the expansive Kanas Lake, which rests deep within a valley of the Altay Mountains. Its crystal clear waters originate from the Kanas Glacier and run for over 125 kilometres (77 mi) along the Kanas River before finally joining the lake itself. It was formed over 200,000 years ago as a result of glacier movement and is the deepest freshwater lake in China, plunging in at depths of up to 120 metres (394 ft.). Stretching out over an area of 45 square kilometres (17 sq. mi), it is over three times the size of Lake Windermere! Seasonal changes and weather conditions endow the lake with a constantly changing appearance. In May, melted snow from the surrounding peaks turns the water a greyish blue colour; in July, it turns a bright aquamarine; in August, the algae turns the water a deep green; and from September onwards it goes a rich turquoise. As if in tandem with these watery wardrobe changes, the surrounding alpine forests also evolve, with dense greens in spring, thick multi-coloured blankets of flowers in summer, and lush golds, reds, and yellows in autumn. Yet don’t let Kanas’ idyllic appearance fool you; it’s not like your typical lakeside retreat. Temperatures here can plummet to -24°C (-11°F) in winter and rest at an average of about -4°C (39°F), reaching heights of just 18°C (66°F) in July. So if you’re taking a trip to this natural paradise, be sure to wrap up warm! The low temperatures mean it is the only region in China that is home to Siberian animal species and, with over 117 different species of bird regularly nesting here, it’s also a haven for bird-watchers. But these aren’t the only strange creatures prowling the area, or at least that’s what paranormal researchers would have you believe. Since the 1980s, rumours of the Kanas Lake Monster have enthralled visitors and nowadays sightings of it occur once or twice every year. It is even said that, on the odd occasion, it drags local livestock into the lake’s murky depths! Scientists believe the most likely culprit to be a large taimen or Siberian salmon, which people have mistaken for an otherworldly creature. These freaky fish can reach lengths of nearly 2 metres, so it’s no wonder people might be horrified at the sight of them! Another bizarre phenomenon is that the sixth bay, which rests at the end of the lake, is flanked by a 2,000-metre-long (6,500 ft.) bank of dead trees. No one knows exactly what is stopping the trees from floating downriver, but locals will tell you it’s because they’re reluctant to leave the beautiful lake! These days the lake is a popular destination for hiking, rafting, rock climbing, paragliding, and boating, with the most popular hike being the one to Guangyu Pavilion. This scenic spot offers a stunning panoramic view of the surrounding mountains and grasslands. In terms of accommodation, Burqin is the closest town and the best option if you want easy access to the lake. From there you can also visit the nearby village of Hemu, which is a popular site for tourists as its home to people from the Tuvan ethnic group, a Siberian people who have Mongolian, Turkic, and Samoyedic roots. 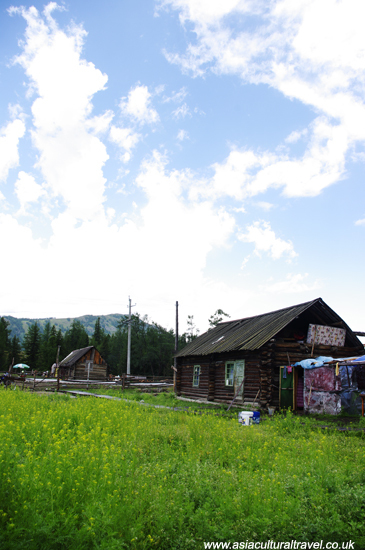 The village rests on the Hemu Grasslands and visitors have the choice of either staying with a Tuvan family or venturing onto the plains and staying in a yurt with people of the Kazakh ethnic minority. It’s a wonderful way to connect with other cultures, sample their delicious local dishes, witness their centuries-old customs, and experience their unique way of life. That being said, bear in mind that the Tuvan people trace their ancestry back to the legendary troops of Genghis Khan, so be sure not to get on their bad side!